Banner stands are a cornerstone of trade show advertising. It’s a simple concept that can make a huge visual impact and communicate a great deal about your Austin or San Antonio business. It’s a versatile tool that has a great return on investment, no matter what your budget is. 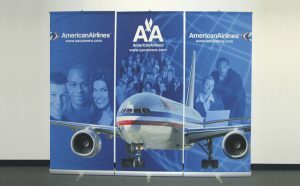 Banner stands can do much more than advertise your Austin business at a trade show or event. They can educate, inform, and entertain year round in a variety of ways. Here are 5 innovative ways to make the most of your banner stand investment between events. Banner stands are for more than just trade shows. Sales and discounts can be great, but as the saying goes, “you get what you pay for”. Cheap banner stands are inexpensive for a reason: they are often made from flimsy material, so they are more prone to break and bend. Many inexpensive banner stands last less than two years. Investing in a better quality banner stand will save you time and money in the long run. Imagine the embarrassment of setting up a cheap banner stand at your important event, only to watch it wobble and bend. Your brand is reflected in the strength of your image, so make sure you are presenting yourself in the best possible way.